February Records turned 5 in 2014 and to celebrate, we are releasing a CD compilation featuring 14 bands spanning the length of our catalog. Most of the songs have never been released and are exclusive to this comp. We wanted to make this project special. We think we have. Bands featured on the compilation are: The Swapsies, Brilliant at Breakfast, Ry Smith, Onward Chariots, Summer Library, Boy Genius, Lunchbox, Finnmark!, Ghost of Chance, Secret Charisma, The Halamays, Cozy Catastrophes, The Month of June and The Pretty Greens. 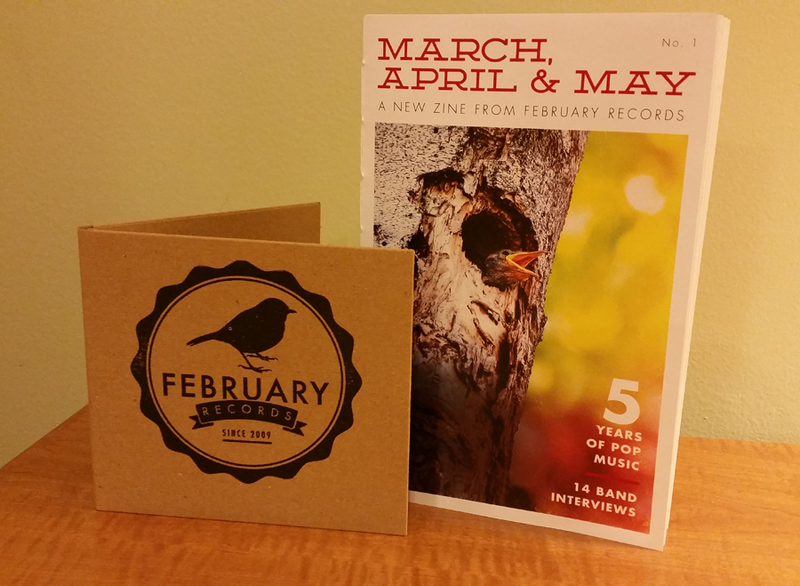 In addition to the compilation, we’ve produced the first physical edition of our zine, “…March, April & May.” The 60-page zine includes interviews with 14 bands plus articles on DIY culture in New England and some February Records history. 1. The compilation and zine combo is limited to 100 copies and includes a digital download. 2. Download the digital version of the compilation from our bandcamp page. 3. Order the “March, April & May” zine on its own. Orders of the CD/zine combo received before midnight (U.S. Eastern Time) Wednesday, February 4, will be entered for a chance to win a February Records feltie keychain made by Lynn Chan, The Quirky Girl Crafter. If you never downloaded the two free singles from Onward Chariots … well, sorry, you’ve missed your chance. The New York quartet has a new single coming out on Spain’s Elefant Records this weekend. Onward Chariots have accomplished quite a bit since those first two free releases early this year. Those songs received a lot of well-deserved praise and caught the ear of indiepoppers around the world. In addition to the Elefant single, the band played the Indietracks festival in England and Athens popfest this summer and will be playing Popfest! New England next month. The Elefant single takes four of Onward Chariots’ best tunes from both February releases and offers them up in a nice little package. With great cover art and a reworked version of “Save Me Maryann,” you should get a hold of this release even if you did download the free singles. Plus, the Elefant single is being offered on white vinyl. Hopefully this release will open more doors for Onward Chariots. We wish them the best. Head over to Elefant and check out the “Save Me Maryann” single. Chariots of Tuna have changed their name. No longer should you picture a wagon of fish when you hear the sweet pop tunes penned by Ben Morss and company. From here on out they will be known as Onward, Chariots. I’m a fan of the new name … it looks to the future and apparently, the future is looking bright for our friends from the big city. Onward, Chariots have been asked to play in two pop festivals this summer — Athens (GA) PopFest and the Indietracks pop festival in England. Both are quite well known in the pop world and it’s a feather in the cap of the band to be playing these gigs. It’s also somewhat of a feather in Tweefort’s cap to have this band on the roster. You can still download both EPs from Chariots of Tuna Onward, Chariots over on our releases page. EDIT: Chariots of Tuna are now Onward Chariots. Tweefort heartily approves the name change. Tweefort Records is proud to announce its first new release — a single from New York pop quartet, Chariots of Tuna. Tracks are no longer available. Check out Onward Chariots’ new single on Elefant Records. 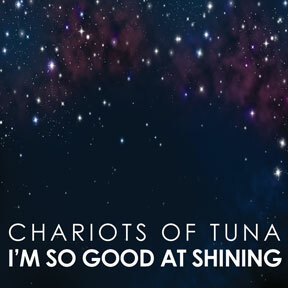 Two songs can say so much when they are presented by New York pop quartet Chariots of Tuna. With equal parts hard and soft, Ben Morss and company present a wide spectrum of sound in just under 5 minutes playing time. Morss’ carefully constructed tunes, delicate falsetto harmonies, loungey vibe, and solid beats recall pop from the Beach Boys and Shins to the Decemberists and Beck. Songs speak of the apprehension, anxiety and excitement of change, the ache of long-distance love affairs, faith and confusion and the simple self-pity of an unloved songwriter. In 1999, in Sacramento, Morss began recording songs under the name “Chariots of Tuna” for indie-pop compilations such as I Made It Out Of Clay (Little Shirley Beans Records) and Candycore! (Asaurus Records). After relocating to New York, the project went on indefinite hiatus. In 2008, Morss, Dan Davine, Shawn Setaro and Rus Wimbish were playing together in the theatrical classical-pop hybrid group, the Infinite Orchestra. In their small practice space in Brooklyn, these skilled musicians hatched a plan to revive Chariots of Tuna. They recorded three songs in that same practice space. Morss sang layers of vocals and overdubbed keyboards late at night while holding his sleeping baby son. Davine engineered and produced the result. Chariots of Tuna returned to life. Chariots of Tuna wants to bring you great songs. Enjoy! Aahhh! A new single from Chariots of Tuna is better than Christmas, and this one is actually better than most things I can think of! I adored their debut single, as you can see from my review, but the band has really progressed since then, and this is even better than I had dared to hope for. The songwriting is even more to the point, the vocals are more focussed and better, and these two songs are two gorgeous pop-treasures that in my ears are perfect. I am one of those who feel a little pain when I hear ecstatic guitar solos, but on “Seven miles away”, even the guitar solo is good! Since an extended winter cold snap seems to have taken seasonal residence in our little corner of Ohio, we can think of no better way to defrost the ears than with a previously featured artist who has a decidedly warm new guitar pop single to share. 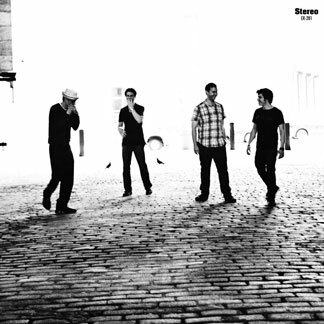 Chariots Of Tuna is the oddly named, Brooklyn/Queens, New York four piece we made original mention of last year in July 2009 with their impressive EP Fondness Makes The Heart Grow Distant. If you have the chance, we recommend a visit to our previous review for links that might give a better understanding of the history and accomplishments of the musicians involved with this project. The brand new single from Ben Morss & company is titled I’m So Good At Shining and is now available for free download through lovely Connecticut-based label Tweefort Records (Tweefort MySpace). Once again, we are smitten with what we can only hope might be the precursor to a full-length album for this band. EDIT Feb. 4, 2010: Chariots of Tuna included in Burning World blog Pod Fodder. Once again Ben Morss and company present a wonderful little EP with two shiny gems “A New Beginning” and “Seven Miles Away” – both are delicate pop candy full of falsetto harmonies and club beats matched with a perfectly placed guitar riff in the latter track. Bring on the full length guys, these freebies just whetted my appetite for more Tuna (In a Chariot). … Formerly known as Chariots of Tuna (an excellent name in itself), the band is now on a renewed push for indiepop superstardom. The pace that the slightly hushed harmonies propel the song along almost masks just how complex the arrangements on these songs are. Seven Miles Away even has time to rock out just a bit at the end too. It’s all very reminiscent of the dearly missed Beulah. Not exactly the same musically, but this is the closest a band has come to evoking the same kind of feeling to me. EDIT: Dec. 24, 2010: “I’m So Good at Shining” included on Burning World’s Best of 2010 list. New Haven band Death To New England will perform with New York pop band Chariots of Tuna and Southington duo The Sawtelles Wednesday, Oct. 14 at Cafe Nine, 250 State St., New Haven, CT.
Death To England are made up of members of some of New Haven’s best recent — and now defunct — pop bands. Sean Beirne of Joanie Loves Tchotchkes and Battlecats and Jimmy Jude of Battlecats and Lamb Bombs are joined by drummer Blaz. Death To New England play their own brand of blues-inspired rock. New York City band Chariots of Tuna play lovely baroque alternative pop. Ben Morss’ carefully constructed tunes, delicate falsetto harmonies, loungey vibe, and solid beats recall pop from the Beach Boys to the Shins to the Decembrists and Beck. Morss has also played keyboard on albums by bands such as Cake and Wheatus, and has played with California acid-jazz kings 11:11 at festivals such as SXSW and NXNW. The Sawtelles are a spare duo, but remarkably complete: Just a drummer and a guitarist manage to fill out a whole spectrum of sound that can be compared to early Traffic, Velvet Underground and Let’s Active. Peter plays guitars, ukulele and sings and Julie plays a stand-up drum kit. The Sawtelles can be seen all over the state of Connecticut playing everywhere from farmer’s markets to intimate shows to opening for up-and-coming indie bands. Death To New England will perform with Chariots of Tuna and The Sawtelles at Cafe Nine in New Haven Wednesday, Oct. 14. Music starts at 10 p.m. 21+. This is a FREE show.